Jack Frost may start nipping at your nose soon, so start planning your winter getaways. 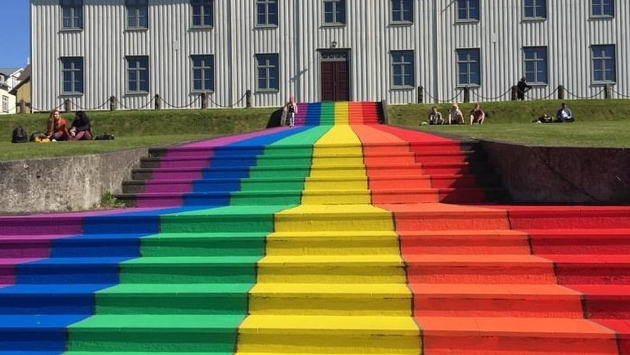 Here are 7 great winter travel destinations that are LGBT friendly. Paris, France: One of the most romantic European cities and they welcome LGBT visitors with open arms. In December, the City of Lights is just as chilly as New York and there is a chance of snow, but hey, you are right near the Eiffel Tower (selfie time!) and The Louvre Museum, the world's largest museum, where you can walk arm in arm and look at some of the greatest art. There are also a lot of gay clubs where you can enjoy the nightlife of Paris, including Les Souffleurs. If you’re traveling in November, check out the LGBT Film Festival, Cheries Cheris, at the end of the month. Arosa: Located in Switzerland in the middle of the Swiss Alps, this town hosts one of the biggest gay and lesbian winter sports events in Europe. This year, Arosa Gay Ski Week will take place during the last week of January, 2017 and attendees from more than 30 countries will attend. Enjoy skiing, curling, cross-country skiing, tobogganing, paragliding and romantic horse-drawn carriage rides. You can also get your giggles on in December at the Arosa Comedy Festival. Reykjavik: This is the capital and largest city in the one of the most beautiful countries in the world with its glaciers, waterfalls, geysers and volcanoes. Sit in one of the countless hot springs in the area or learn about these volcanoes at The Volcano House. When you’re looking for some down time, check out the great LGBT bar scene, such as Bravo and Kiki. Puerto Rico: Forget the cold weather and head to Puerto Rico for some fun in the sun. It’s one of the most gay-friendly island destinations in the Caribbean and includes such venues as Calle Vendig, and Oceano. When you’re done touring San Juan, get your groove on at Circo, a popular gay dance club. Vieques Island is also becoming known as a LGBT-friendly destination. Curacao: This Dutch Caribbean island is known for its beautiful beaches. Here you can enjoy the waters such as Blue Bay, Playa Lagun and Blauwbaai. There are more than a dozen hotels and attractions that hold membership in The International Gay & Lesbian Travel Association (IGLTA) — the most of any Caribbean island. You’ll love walking and hiking in Christoffel National Park, where you can see barn owls, White Tailed deer and 450 species of plants. San Francisco, California: It’s a gay-friendly mecca and one of the most popular in the world. San Francisco was touted as the “Gay Capital of America” in Life magazine back in 1964. Here, the arms are open wide to welcome all LGBT tourists, who can tour the Golden Gate Bridge, and the famous Alcatraz Prison. When you’re done touring, hang out at Oasis, a 6,000 square foot theater/cabaret/nightclub. Vienna, Austria: This European country has one of the richest gay histories in the world, hosting several pride events -- The Rainbow Ball, The Rosenball, The Kreativball and the Diversity Ball. When you’re not dancing the night away at the balls, enjoy tours of the former Ankerbrotfabrik (Anker Bread Factory), which is now a contemporary art gallery, and The Literature Museum of the Austrian National Library. Listen to music at the Vienna State Opera and don’t miss the amazing Christmas market where you can bring home some trinkets for your family and friends.